All the grip, none of the weight. 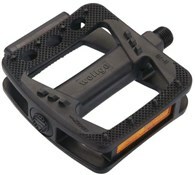 Eclat's new Surge pedals are quite simply, the grippiest nylon pedal on the market. 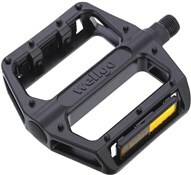 Constructed of a nylon/fiberglass blend, the Surge pedal features a knurled concave surface, hardened cromo steel spindles and reinforced construction. Simple, effective and lightweight, the Surge pedal combines the best aspects of a nylon pedal without sacrificing pedal grip.